Long time, no blog post! It has been a crazy busy past two years, filled with some of the best times, and unfortunately also some of the hardest times. My quilting fell to the back burner, but I still made small progress here and there. My next posts are going to jump around on the quilt order since I got to where I had numerous quilts in various states of progress over the past 2 years. 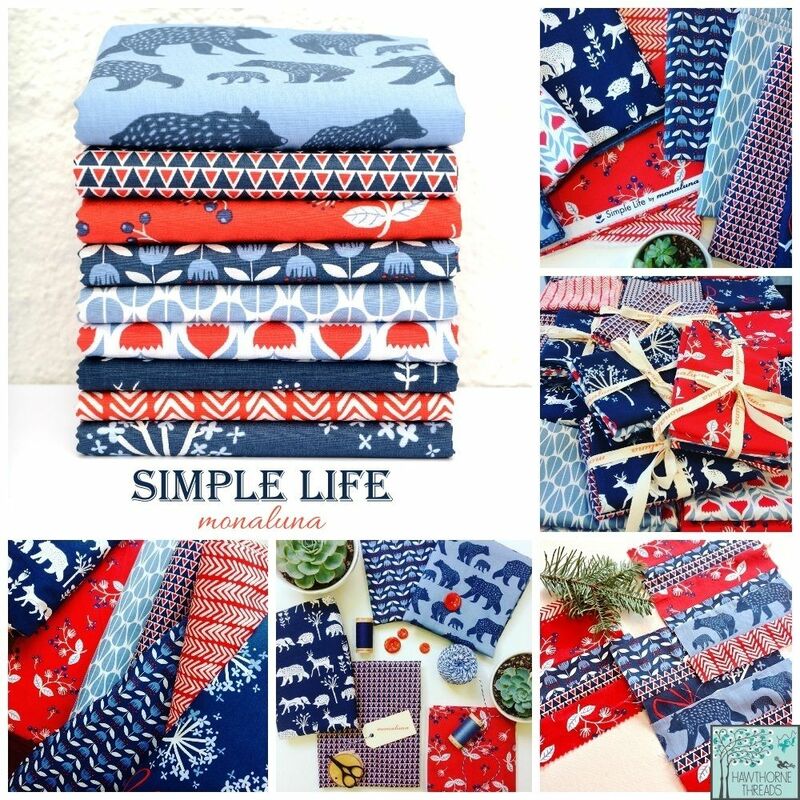 I was given a quiltybox subscription for my birthday, and the very first box I got, came with a beautiful line of MonaLuna – Simple Life fat quarter bundle. With the 4th of July around the corner, I immediately thought about creating a picnic blanket to use. I think my favorite part of this fabric line is all the bears! I mean… who doesn’t love a bear on some fabric! This line came with a selection of coordinating Canvas which works great for backing on picnic blankets. I bought the canvas from Hawthorne Threads. The prints on the fabrics are so perfect I scoured Pinterest and Instagram for patterns that wouldn’t make me cut them up into small pieces. I came across the Swoon Pattern by Camille Roskelley of Thimble Blossoms. Each block is a 24-inch block so it works well for larger print fabrics that you want to preserve. Unfortunately, I didn’t have enough fat quarters to make the full pattern, so I went with 4 swoons, and then used the leftover scraps to make a border along the top and bottom. Since it is a picnic blanket, I didn’t want to use heavy batting, so I found some cheap flannel online and used that as my “batting” layer. The backing is the dark triangle print in canvas. I figured this fabric would hide dirt and grass stains the best out of all the prints. I used the poplin version of the triangle fabric as the binding. I had just printed up a whole bunch of labels on Spoonflower right before we moved, so I still have many left, and I am not about to waste them! I realize I no longer live in the Beautiful city of Castle Rock with its 15% humidity, beautiful cool weather, and so many missed friends. I kept the quilting very simple and minimal. Machine binding was fast and will be more durable for a quilt I expect to see some abuse. My husband and I went to Breck for a little vacation, and I took this quilt along to get some pictures of it in the most beautiful places. Did I make my husband feel ridiculous hiking around with a quilt? Sure. BUT the pictures were worth it.